Rodney LeJeune began his music and singing career at the age of 17. He has played Cajun music with many fine musicians beginning with Andrew Cormier. 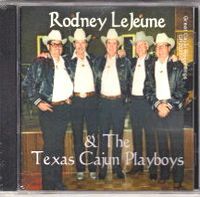 Due to the demands from his many fans, this special 16 songs CD Album was recorded using the original 45rpm records Rodney recorded in the late 1950's thru 1970's. Special thanks to Floyd Soileau, the late Huey Meaux and Buford Galley for allowing us to compile these recordings. Listen to the song samples then order your copy of the CD for your personal enjoyment.